There is nothing like a seasonal bowl of soup to warm you from inside out. 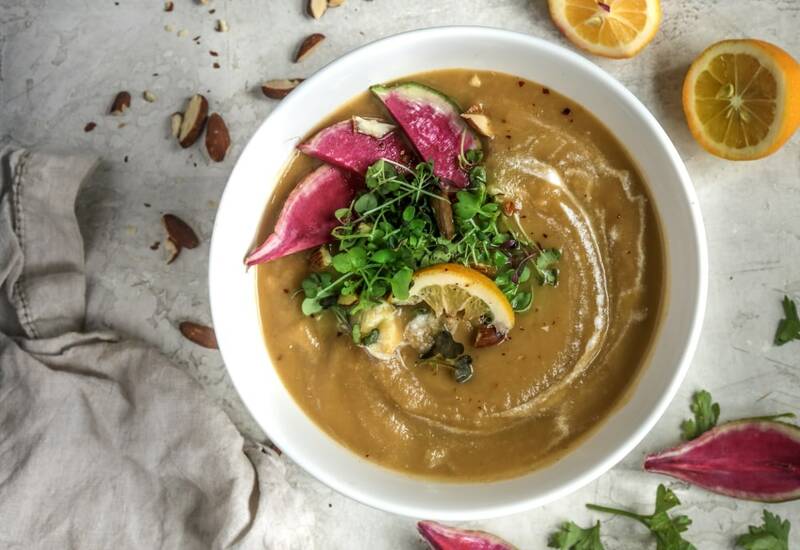 The seasonal root veggie flavors of fall meld together to make this soup. I wanted something beneficial to the gut, and the fennel and ginger not only create a wonderful flavor combination, but aid in digestion. The cumin and ginger warm the body from the inside out. This soup is comes together in just 40 minutes using the pressure cooker and immersion blender, and it has a delightful velvety finish. Heat ghee in pressure cooker set to Sauté on Normal. Sauté fennel, onion, garlic, and ginger in hot ghee until onion and celery soften, about 4 minutes; season with cumin and salt. Stir parsnips, rutabaga, bone broth, coconut aminos, and liquid aminos with the onion mixture. Use immersion blender to purée all ingredients until soup is smooth. Ladle soup into bowls and garnish with desired toppings to serve. To make this recipe vegan, use coconut oil and vegetable broth instead of the ghee and bone broth. Use other root vegetables like carrots and sweet potatoes for a different flavor and color. Per Serving: 232 calories; 7g fat; 32.6g carbohydrates; 15g protein; 11mg cholesterol; 1148mg sodium. Very flexible recipe - and great every time. Most recently was vegan, with sweet potato, parsnips, and zucchini. Seasoning consistent with recipe, and coconut oil instead of ghee. Very yum. When most people are pulling out their slow cookers for fall, I'm breaking out the pressure cooker to make soups and chilis. I added this recipe to my repertoire and it's easily a new favorite. Great texture, very creamy, and easy to make. Only substitution I made was using regular butter instead of ghee. Lots of rich, earthy flavors in this soup recipe. I didn't use bone broth, but swapped it for chicken broth instead. If you're looking for a nutritious, veggie-packed soup this is a good one to try.